Bognor Regis is a traditional seaside town at the centre of the South Downs. The area is renowned for its flat beaches and long promenade which makes this area ideal for families. The town is proud of its clean beaches and relaxed atmosphere and is traditionally known as the sunshine capital of England. Situated on the sea front of Bognor Regis very close to the pier and a short walk to the local amenities, The Royal Norfolk Hotel is in an ideal position to visit this seaside town. There is free WiFi in public places and a relaxing bar and lounge accessible to all guests. The rooms have en-suite, television, hairdryer and complimentary tray with a lift access to most floors. 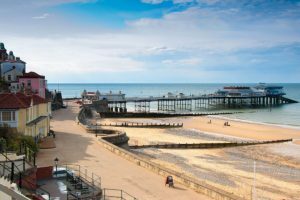 Cromer is a firm favourite with families and is a typically traditional seaside resort. Perched on the very edge of the North Norfolk coast with wide open beaches and the famous tasty crabs the area has plenty to offer. Cromer has an array of shops, cafes and restaurants but also includes the more traditional bucket and spade and seaside gift shops. The Hotel de Paris is a delightful grade 2 listed building set in the finest position in Cromer. All shops and local amenities are close by and the hotel overlooks the beach and pier. There is WiFi in public places and a lift serves most floors. The rooms all have en-suite with television, hairdryer and complimentary tray. There is a bar and lounge available to all guests to help you wind down after a long day. The South Wales of Porthcawl is a popular destination for holiday makers. The unique mix of seaside and surrounding countryside makes the area attractive both for families and walkers. The beaches have been awarded blue flag status for their excellence and is often used for surfing and other watersports alike. The Sea Bank Hotel commands coastal views to the east, south and west, yet is only a small walk to the centre of Porthcawl. Although the hotel is a period property all rooms are tastefully decorated and include en-suite, television, hairdryer and complimentary tray. There is free WiFi in public areas around the hotel and a bar and lounge for you to relax after a long day. There is lift access to most floors.